October is the perfect time of year for stories, movies, and apps with magical themes. I believe this is why Julia Donaldson, Alex Scheffler, and Magic Light Pictures decided to release a brand new app based on the children’s picture book Room on the Broom. In Room on the Broom: Games, children will find mini games inspired by the story of a good-hearted Witch and her Cat who invite their friends to ride their magical broom. Even though the broom is crowded, the Witch doesn’t seem to mind. In return, her friends (the Dog, the Bird, and the Frog) help her in times of need. 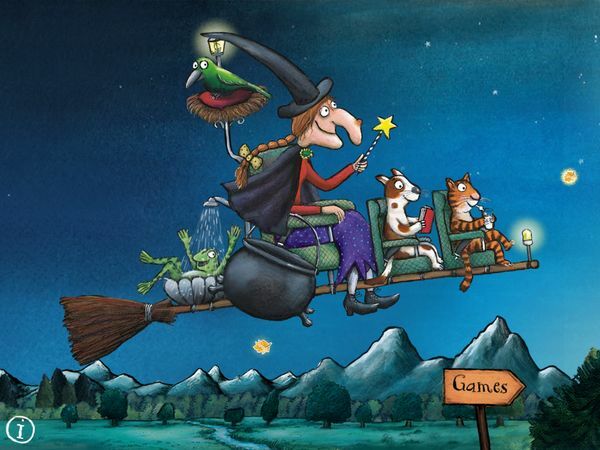 In Room on the Broom: Games, the games are shown as floating bubbles in the night sky. To browse the games, your child will need to scroll to the right as though she’s flying with the broom. The games can be played in a particular order, so your child can simply tap the one she wants to play. The app has 6 unique games, with one mechanic implemented as three different games. The first game is called Join the Stars. In this game, your child drags the Witch from one star to the next to complete a picture. At the end of the game, she is asked to name the item. A correct answer will merit a bronze medal. There are 3 kinds of medal that your child can collect from each game: bronze, silver, and gold. In order to get a more valuable medal, your child will need to complete various challenges. For example, in the Join the Stars game, she must correctly identify three items in a row to get a silver medal. The next game shares a similar mechanic as two other games in this app. In these games, your child is asked to find Witch's belongings that have fallen from the sky. This is where the Dog, the Bird, and the Frog help the Witch to find the items. Windy Day Collecting is a unique game where your child must collect the glowing golden leaves and the Witch’s belongings that have been blown away by a strong gust. It’s a game that requires good reflexes as your child needs to catch the items before they are blown off the screen. In Drawing with Stars, your child can construct their own star formations. She can also tap on each star to change its color. When the Witch flies through them, she will leave a colorful trail and form a beautiful drawing in the night sky. The next game features the Witch's enemy: the red Dragon. The Dragon loves to hunt for the Witch, but he also loves to eat potato chips. Your child must feed the Dragon with potato chips until he is full to hopefully keep him away from going after the Witch. Be careful not to feed him with other items. In the final game, your child can board on the Witch’s broom and collect shining letters that look like stars from far away. The game is similar to a flight simulator game in that it features a first-person cockpit view. Your child must carefully steer the broom so that it hits the letters and form the required words. The games in this app are based on the best selling book by Julia Donaldson, Room on the Broom. The illustrations in the book and in this app were done by Axel Scheffler. The book has also been adapted to a 26-minute animated film, which is available on iTunes. The games have been designed for ages 3-7. Some games, such as Join the Stars and the scavenger hunt games, are suitable for young children, whereas other games, such as Drawing with Stars and Fly the Magnificent Broom, are more suitable for children with excellent motor skills. Connect-the-dot games may sound boring for older children, but Room on the Broom: Games proves otherwise. The connect-the-dots games in the app are fun because the app allows you to trace freely. You can, for example, move in any direction, make loops and other crazy paths, and the Witch will always follow. In Dragon Eat Chips, controlling the Dragon’s movements can be tricky. Each time you tap the Dragon, he will open his mouth. His mouth will stay open until you release your finger. To move the Dragon, you also need to tap, hold, and drag. So, when the Dragon moves, he will move with his mouth wide open. It can be quite challenging to move him in a way that will keep unwanted things away from his open mouth. Can you guess the object formed by the stars? Room on the Broom: Games offers games that children will enjoy this Halloween and all year round. Some of the games are easier, while others rely on fine motor skills and good reflexes. Children can even get really creative with drawing their own colorful star constellations. Recommended for fans of the original book and children with a knack for tricks.